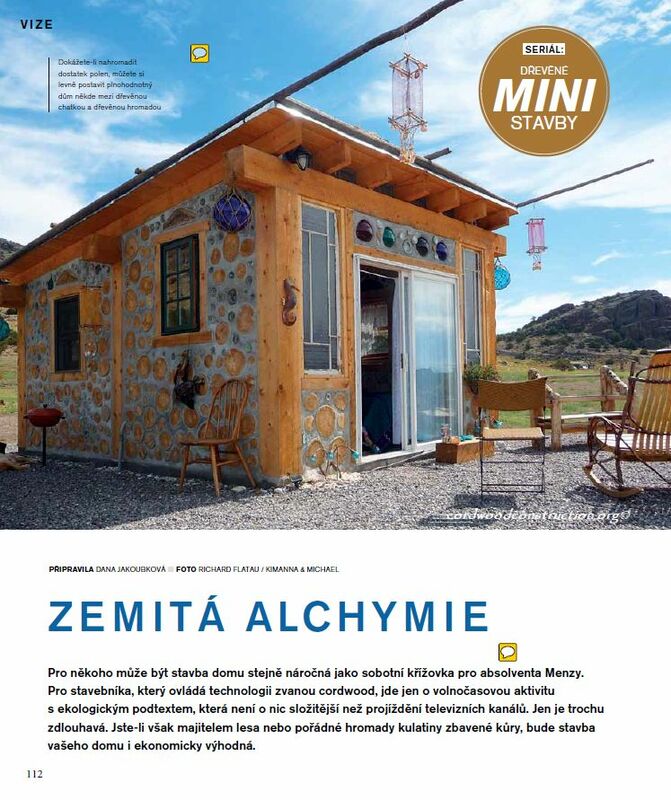 The prestigious Czech architectural magazine Drevo & Stavby: Kvalini Casopis recently featured the Mermaid Cottage. 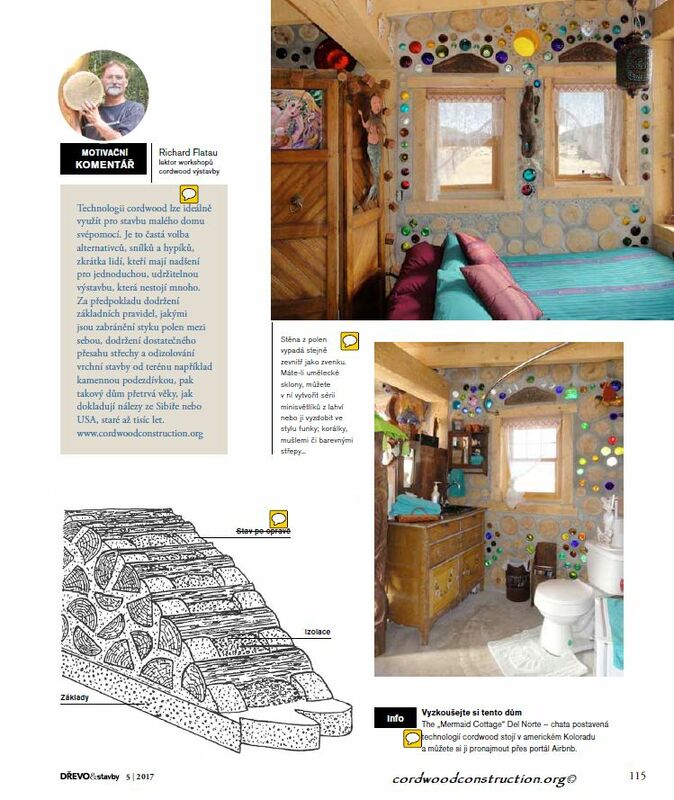 Kimanna & Michael built this beautiful BnB in Colorado using cordwood construction with mermaid motifs. Although this article is written in Czech, fear not, for there is a translation further down the page. 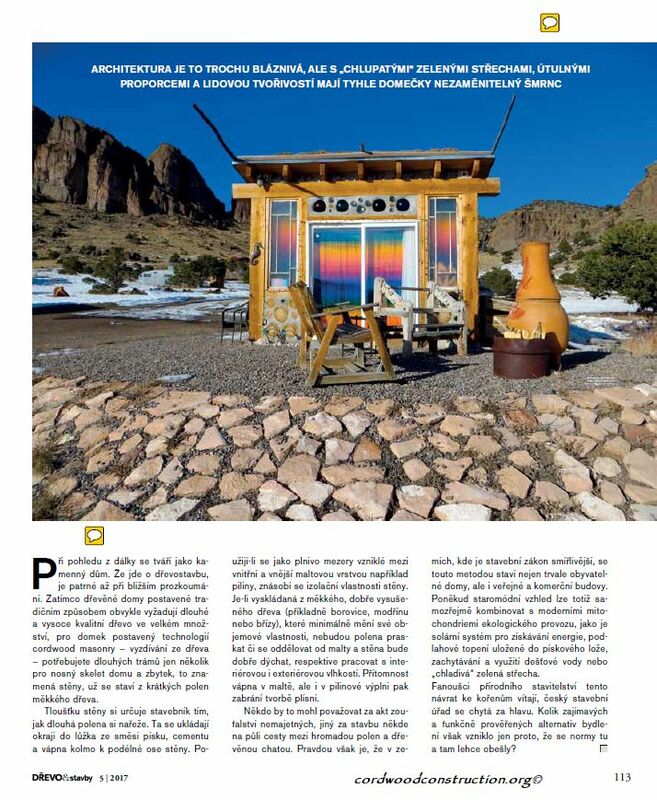 The article calls cordwood wonky and funky folk architecture. I quite agree. If you are able to accumulate enough logs, you can cheaply build a full house somewhere between a wooden cottage and a wooden heap of Earth alchemy. For someone, the building of a house can be as demanding as a crossword puzzle for a graduate. 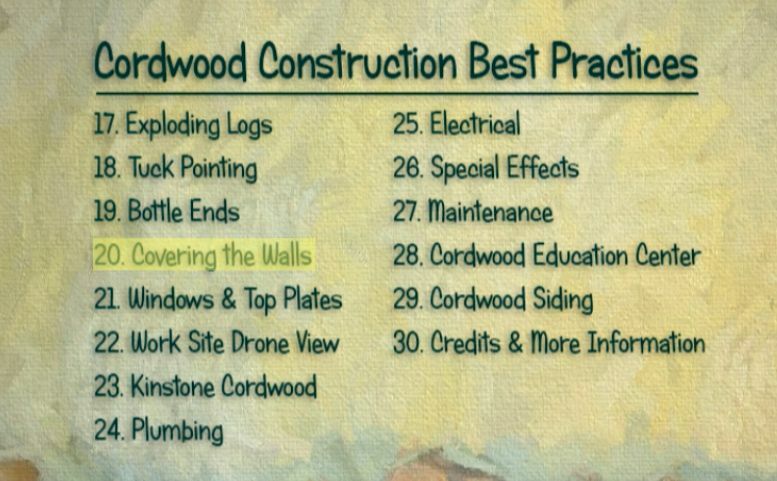 For a builder of cordwood technology, this is just a leisure time activity with an ecological subtext that is no more complicated than going through TV channels. It’s just a little tedious. However, if you are the owner of a forest or a large pile of bark that is rid of logs, then the construction of your house will be economically beneficial. Architecture is a bit crazy, but with “hairy,” green roofs, cozy proportions, and folk creativity, these houses have an unmistakable sparkle. Looking from the distance, it looks like a stone house. That it is a wooden building is obvious only after a closer examination. While wooden houses built in the traditional way usually require long and high quality wood in large quantities, for a house built with cordwood masonry technology – wood-trimming you need long beams only a few for the load-bearing skeleton of the house and the rest, that is, walls, are already built from short softwoods wood. Thickness of the wall is determined by the constructor by how long the logs cut. They are placed in a bed of a mixture of sand, cement and lime perpendicular to the longitudinal axis of the wall. If the filler gaps between the inner and outer mortar layers, for example, sawdust, are used, the insulation properties of the wall increase. If it is made of soft, well-dried wood (for example, pine, larch or birch), which at least changes its bulk properties, the logs will not burst or separate from the mortar, and the wall will breathe well, respectively work with indoor and outdoor humidity. The presence of lime in the mortar, but also the filler prevents mold formation. Some might consider it an act of despair of the poor. Another for building somewhere halfway between a heap of logs and a wooden cottage. The truth is, however, that in countries where building law is more congenial, this method builds not only permanently habitable houses, but also public and commercial buildings. A somewhat old-fashioned look can, of course, be combined with modern mitochondria of ecological operation such as a solar energy system, floor heating stored in a sand bed, capture and use of rainwater or a “cool” green roof. Fans of natural construction are welcoming this return to the roots, the Czech construction office is catching up. But if we always have to meet standards, how many interesting and functionally tested housing alternatives have arisen just because the norms have been around and over and over? 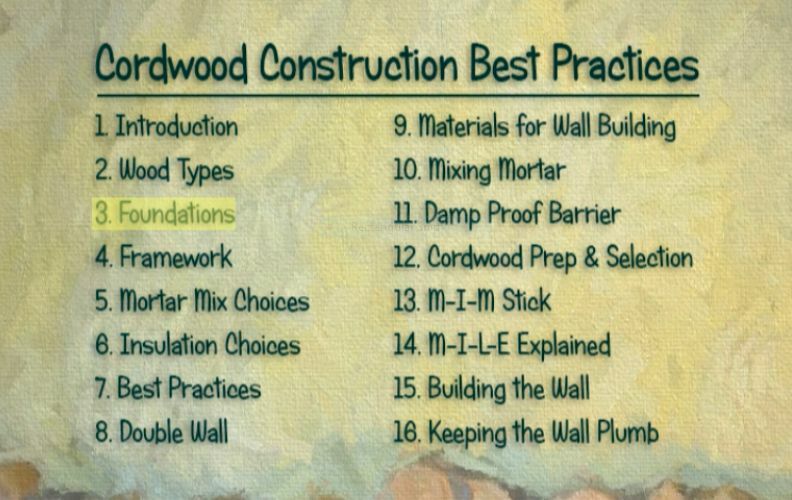 Cordwood technology can ideally be used to build a small house by self-help. It is a frequent choice of alternates, dreamers and hypers, simply people who are enthusiastic about a simple, sustainable construction that does not cost much. Assuming basic rules such as preventing the interlocking of the logs, keeping the roof overhead and stripping the top structure off the ground, for example, a stone wall, then such a house will last forever, as evidenced by the findings of Siberia or the United States of America, up to a thousand years. Here are a few more photos of Kimanna & Michael’s masterpiece. The lovely Kimanna tuckpointing to her heart’s content. The mountains make the setting serene and restful. If you love light and color, this may be worth a visit. 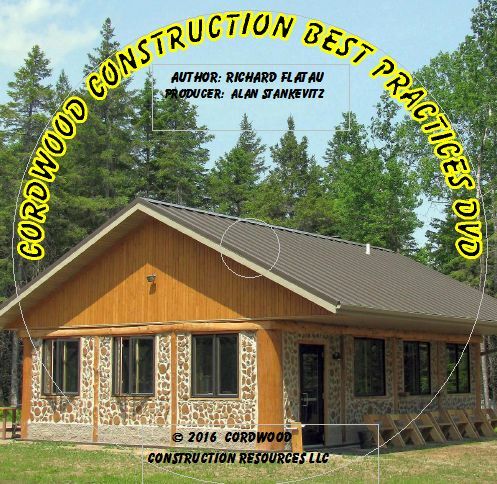 The Cordwood Workshop Video label. The Drone View is especially spectacular!